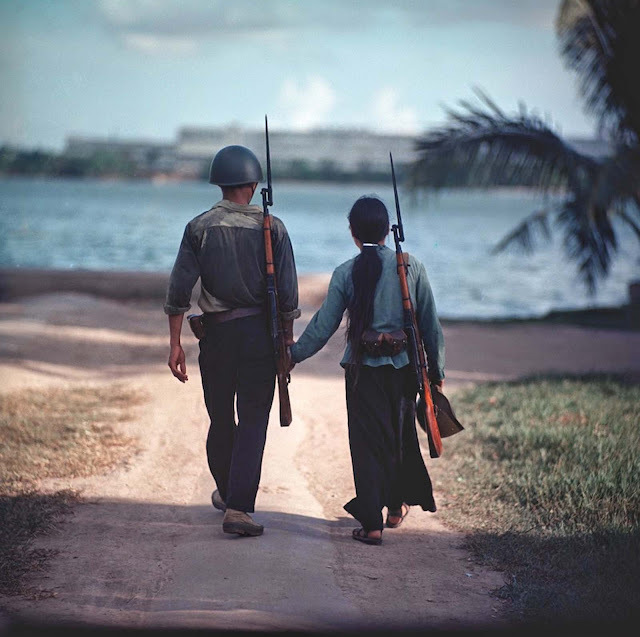 A couple of warriors holding hands, Vietnam, 1971. This picture is a demonstration of the soldier as a human. They’re using WWII era Russian equipment: Mosin Nagants and a helmet. They’re not part of the People’s Army of Vietnam judging by their civilian clothing. Photo taken by German photojournalist Thomas Billhardt. Looking further into Billhardt’s photograph, it seems that he spent most of his time in North Vietnam (with occasional trips to actual fighting ground). So presumably what we’re looking at are two individuals that are part of a local defense force somewhere in North Vietnam. This would explain as to how “casual” they look in their loving stroll and with weapons in the open like this. The U.S. government viewed American involvement in the war as a way to prevent a Communist takeover of South Vietnam. This was part of a wider containment strategy, with the stated aim of stopping the spread of communism. According to the U.S. domino theory, if one state went Communist, other states in the region would follow, and U.S. policy thus held that accommodation to the spread of Communist rule across all of Vietnam was unacceptable. The North Vietnamese government and the Viet Cong were fighting to reunify Vietnam under communist rule. They viewed the conflict as a colonial war, fought initially against forces from France and then America, as France was backed by the U.S., and later against South Vietnam, which it regarded as a U.S. puppet state. The war exacted a huge human cost in terms of fatalities. Estimates of the number of Vietnamese service members and civilians killed vary from 800,000 to 3.1 million. Some 200,000–300,000 Cambodians, 20,000–200,000 Laotians, and 58,220 U.S. service members also died in the conflict.